Serious Games & VE Track Monday at IMSH! The SSH Consensus Summit was a lot of work but tremendously productive. Various pre-conference workshops took place Saturday along with several SSH committee meetings. IMSH 2011 speakers and attendees continue to arrive. Ben DeVane (University of Florida – Gainesville) and Aurel Mihai both arrived today. Aurel is a co-facilitator for the Serious Games Track. 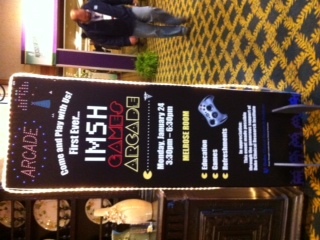 Ben will will be participating as a session respondent and staffing the first ever IMSH Serious Games Arcade . Attending IMSH 2011 this month? Follow the conference on Twitter! Eric B. Bauman and Aurel Mihai will be heading to New Orleans in the coming days for IMSH 2011 and the pre-conference Summit. Bauman and Mihai will be facilitating the Serious Games an Virtual Environments Track. This year we will be introducing the first ever Serious Games arcade. The Summit will be taking place on January 21-22 and the the IMSH conference runs January 23-26, 2011. Both are taking place at the Hilton Riverside. Clinical Playground is now on the air! Hope you like the site! Y’all come back now, you hear?